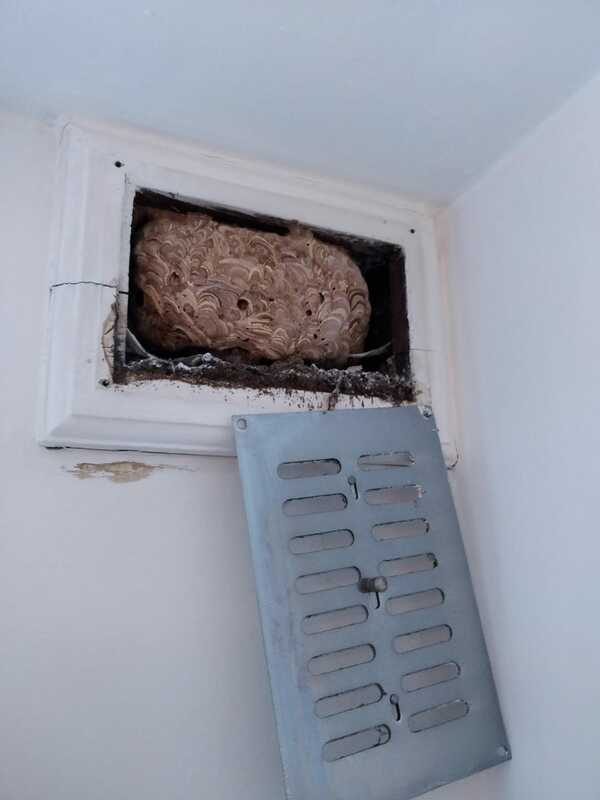 Londoner Craig Ewens thought he was hearing things inside his flat until he saw wasps flying in and out of an external brick vent. Pest Professionals’ RSPH Level II qualified technician Mark Thompson came to the rescue, initially treating the wasp nest from the outside and then returning to proof the vent with insect proof mesh to prevent it happening again. On that second visit he thought he’d have a look inside as well – and on taking off the internal vent cover discovered this thing of beauty! The wasps had built their nest up right against the internal vent cover! No wonder Craig could hear a loud buzzing noise in the wall all summer! Worker wasps die out in the winter with only the new queens hibernating and surviving in their own little cocoons to emerge in the spring. The dormant nest has now been removed and disposed of. Thanks also to Craig for taking the trouble to write a great Trust Pilot review…. ← Active wasp nest in January … there is an explanation!